Outdoor storage has never been so practical, or so affordable! If access, efficiency, and a large storage area are what you need then Job HutTM is your answer. 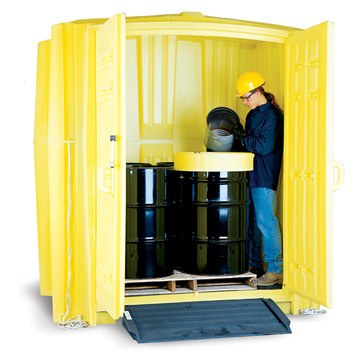 Cost effective, extra large area for up to eight 55 gallon drums. Low profile design allows for easy access. Forkliftable from all sides when empty for easy handling. 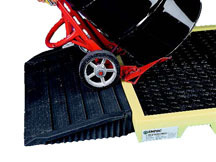 Use with the optional Mulit-Purose Work Ramp. Tough polyethylene construction means it won't rust or corrode, while UV inhibitors make it exrta durable for outdoor use. Molded-in vents reduce fumes and condensation inside. Heavy-duty hinges and lock keep contents secure. 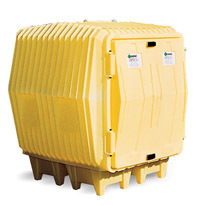 Built-in 72 gallon sump capacity with removable grates for easy cleaning. This item is oversized and must ship with a LTL freight company. The Job Hut ships directly from the manufacturer. Shipping rates are estimates only and do not include fuel surcharges that can change daily. Actual rates may vary.